Oh wow -- ninjas live in Park Slope! But wait -- the true ninja would never advertise his or her whereabouts so crudely. 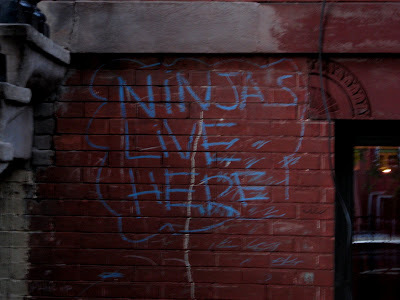 Therefore, ninjas do not live in Park Slope. But the true ninja would know that his or her enemies would think that the true ninja would never advertise his or her whereabouts so crudely. Thus the true ninja might go ahead and advertise his or her whereabouts in just that fashion to lull the enemies into a relaxed stupor and slay them. Therefore, ninjas live in Park Slope. But the enemies would know that the true ninja would know that the enemies would think that the true ninja would never advertise his or her whereabouts so crudely. Therefore, the enemies would not fall for the ploy; therefore, the true ninja would not make such a ploy; therefore, the sign-writer is lying, and ninjas do not live in Park Slope. But the true ninja would know that the enemies would know . . .
Perhaps the ninja's enemies marked his or her house so that other enemies would know where the ninja lives and kill the ninja on behalf of the first enemies. Or perhaps it's actually the first enemies' house and the ninja marked it so that the second enemies would kill the first enemies. Or perhaps it's a decoy house to draw out all the enemies, and the ninja actually lives next door. The Ninja Next Door: Now there's a title for a picture book. Perhaps the Staten Island ninja has moved to Brooklyn! Perhaps a ninja is behind me right now. Perhaps I should stay away from that street.